We’d love your help. 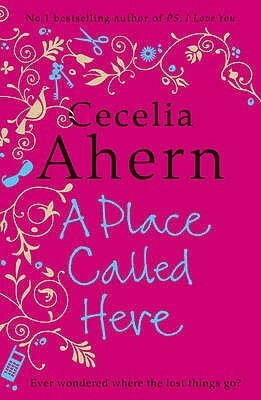 Let us know what’s wrong with this preview of A Place Called Here by Cecelia Ahern. To ask other readers questions about A Place Called Here, please sign up. This novel had the potential to be so much more, but I was left frustrated and disappointed with the ending of the book. I think Ahern could have made her ending much more powerful, instead it is left fairly ambiguous with a conclusion hanging in midair. The idea of a place where all missing objects and people go intrigued me, but at times I was left laughing at the naive idea of all these missing people, from all over the world, speaking different languages, living together in peace and harmony This novel had the potential to be so much more, but I was left frustrated and disappointed with the ending of the book. I think Ahern could have made her ending much more powerful, instead it is left fairly ambiguous with a conclusion hanging in midair. The idea of a place where all missing objects and people go intrigued me, but at times I was left laughing at the naive idea of all these missing people, from all over the world, speaking different languages, living together in peace and harmony, in a self-sustaining community, with freshly baked doughnuts arriving daily courtesy of absent-minded delivery boys, etc. At times, I got really bored with the novel as it felt more like a fairytale story for children, not a book for adults. The relationship between the main character, Sandy, and her psychiatrist, Gregory, seemed completely implausible and unrealistic. There just wasn't enough time devoted into exploring how this romantic relationship could have come about. In fact, Ahern, seemed to hint all along that Sandy would end up with Jack Ruttle, that somehow they 'connected'. I waited for the big reunion at the end but got nothing, Jack went back to the girlfriend he didn't love anymore and Sandy went back to the guy that gave up on her. And what about all the other missing people trapped in 'Here'? Why didn't they get found too? Clearly, a lot of people trapped there, Bobby especially, wanted to get out and return home to their family and friends. Why was Sandy the only one that returned home? I regret to say that I received this book two years ago and just now managed to actually read it. It was my first ARC and I put it aside and it sat at the very bottom of my TBR pile for the longest time. Until this time of year, when I've been trying desperately to get everything out of that box and I finally decided to give this seemingly thick, impossible-to-get-through book a shot. Boy, do I hate myself for waiting so long to read such a literary work of genius. Remember in your school days, I regret to say that I received this book two years ago and just now managed to actually read it. It was my first ARC and I put it aside and it sat at the very bottom of my TBR pile for the longest time. Until this time of year, when I've been trying desperately to get everything out of that box and I finally decided to give this seemingly thick, impossible-to-get-through book a shot. Boy, do I hate myself for waiting so long to read such a literary work of genius. Remember in your school days, when teachers always told you to "show, not tell"? Cecelia Ahern does this, and does it flawlessly, with writing that is not at all awkward like much "good" writing seems to be, nor is it childish. Everything flows. All the words fit together as if they were each handpicked to play the part they are assigned. Coupled together with crazy good characterization, a plot as unique and captivating as they get, this contemporary fantasy should be a must-read for anyone considering themselves a true reader. As lengthy as it is, I got through this book in one long sitting, absolutely refusing to put it down. Cecelia Ahern is the literary genius I have been searching for. I read this years ago, it was actually my first Cecelia Ahern novel. That should have been a big warning for me about how pointless her book can be sometimes, this one included. I remember it was about random things that just kept disappearing. It was boring, not a lot of action going on. Kinda like a sock missing in the washing machine. H Cecelia Ahern έχει ένα ξεχωριστό είδος γραφής και τεχνικής που το διατηρεί αναλλοίωτο σχεδον σε ολα τα βιβλία της. Καταφέρνει να κρατάει πάντα αμείωτο το ενδιαφέρον,να προκαλεί αγωνία και προσμονή,να χρησιμοποιεί λιτή και απέριττη γλώσσα ώστε να μην κουράζει τον αναγνώστη αλλά και να καταγίνεται πάντα με θέματα πρωτότυπα,επικίνδυνα ίσως αλλά και αιώνια αμφισβητήσιμα. Στο "θα σε βρω ξανά"το επίκεντρο της ιστορίας ειναι ολα τα χαμένα πρόσωπα-ζώα-πράγματα που εξαφανίζονται μυστηριωδώς και ο προορ H Cecelia Ahern έχει ένα ξεχωριστό είδος γραφής και τεχνικής που το διατηρεί αναλλοίωτο σχεδον σε ολα τα βιβλία της. Στο "θα σε βρω ξανά"το επίκεντρο της ιστορίας ειναι ολα τα χαμένα πρόσωπα-ζώα-πράγματα που εξαφανίζονται μυστηριωδώς και ο προορισμός τους ή ο τόπος που καταλήγουν. Θα μπορούσε να ειναι ένας σαφής χαρακτηρισμός της ιστορίας μας. Τέτοιου είδους ερωτήματα δημιουργούνται στην πλοκή του βιβλίου και μπορώ να πω πως οι τελικές απαντήσεις δεν ειναι μυθοπλασίες ή προκαταλήψεις. Τα συμπεράσματα βέβαια άπτονται της φιλοσοφίας της σκέψης και των πεποιθήσεων και εμπειριών του κάθε ανθρώπου. Ακόμη κι αν όλο το θέμα της λησμονιάς και του χαμού για κάποιους ειναι αδιάφορο ή φαντάζει εδώ υπερεκτιμημένο, το ταξίδι που προσφέρεται με τούτο το βιβλίο όπως προφανώς και όλες οι γνώσεις,οι αναμνήσεις, οι διαφορετικοί τρόποι αντιμετώπισης και η εναλλακτική φύση και τάξη πραγμάτων που μπορείς να πάρεις ειναι σημαντικά ! This review has been hidden because it contains spoilers. To view it, click here. Light enough that it didn't require deep thought, interesting enough to keep me turning pages, yet not so gripping that I couldn't put it down when I needed to sleep. The story is about Sandy Shortt, who is something of a misfit. She is extremely tall, for one thing, in sharp contrast to her surname. She is also very logical and organized, and has a compulsion to search for missing things - and people. It all started when her neighbor Jenny-May vanishes when they are both ten years old. By the tim Light enough that it didn't require deep thought, interesting enough to keep me turning pages, yet not so gripping that I couldn't put it down when I needed to sleep. By the time the story starts, Sandy runs a missing persons agency. She has reunited various lost family members, but there are still several unsolved cases which she has studied extensively. Then Sandy herself disappears, and finds herself in a different world: one filled with people and objects that have mysteriously gone missing from the real world. It's bizarre and surreal... and yet somehow the story works. In this strange other world there are socks, phones, wallets, even sofas... all of which have vanished without trace. There are also some of the people whose cases Sandy was working on. They have settled down, sometimes even married and had children, accepting their new lives after they've been there for a while. The writing is very good; the story delightful, and unexpectedly moving in places. It's also strangely believable - it doesn't feel like fantasy at all. Where do all things go when they disappear? Cecelia Ahern has the answer for that through this book. The Irish chick lit author who previously wrote the international success PS I love you tried to charm her readers again with her fourth book. Funnily, this book has several different titles in English for example: "There's no place like here" and "A place called here". Anyway, the Danish title that I wrote above translates to "A place nearby"
I must admit that Ms. Ahern has a powerful imagination Where do all things go when they disappear? I must admit that Ms. Ahern has a powerful imagination when she wrote this book. That's probably one thing that would fail me as a book author. My imagination is as thin as air in the Himalaya mountains. I couldn't just daydream about something and actually write about it and not forget about it. She apparently got the idea about this book when she couldn't find her left sock. Perhaps. The book tells the story of a misfit young teenager - now a young woman - called Sandy Shortt. Two facts that I know from her character are that she's not short and that she's not sandy-haired. So don't let her name fools you. When she was 10 years old, her opposite neighbour's daughter Jenny May Butler went missing and nobody could find her and that tickled her inner soul to tell her unconscious mind that she must find any missing thing from that moment on. It's not so much because she has affection toward the missing girl - far from that - it's just only because she gets irritated when a thing goes missing. "It's like you know a lyric for a song by heart and suddenly you forget the words", she said. Sure enough, she grew up to be a un-whole person. She dropped her job in the police corps and started her own investigative bureau to find missing persons as an attempt to seek a peace of mind. Until one day she went missing and found herself in a place called "here" - along with a lot of other people she'd been trying to locate all these years. Including Jenny May. Including her white-and-orange striped left sock. Including her passport. Including the teddy bear she used to have when she was a kid. Now, this is what I called a relaxing yet intriguing chick lit book as I found most chick lit books were too dumb to be worth reading. Believe me, I have many times given up a book halfway because I'm too tired to read the swearings of the main characters about their ex-boyfriends, their disaster dating sessions or their extremely sad and boring single lives. Whatever. تقدیم به تمامی ناپدید شدگان! باشد که دوستان و آشنایان شان با دیدن این یادبود بر استقامت و امیدشان افزون شود. گم کردن وسایل مون به خاطر فراموش کردن بخشی از خاطرات مون اتفاق می افته. اما گاهی ما چیزهای مهم تری از وسایل مون گم می کنیم. مثل یک نوازش یک عطر یا چهره یک شخص و یا طنین صدای عزیزان مون. مردم از قصد خاطره هاشون رو فراموش نمی کنن. البته گاهی ترجیح می دیم فراموش شون کنیم. اما نگه داشتن همه چیز توی ذهن غیر ممکنه و اصلا مهم نیست که چقدر سعی کنی نگهش داری. گاهی وقت ها مردم درست جلوی چشم ما ناپدید تقدیم به تمامی ناپدید شدگان! باشد که دوستان و آشنایان شان با دیدن این یادبود بر استقامت و امیدشان افزون شود. گاهی وقت ها مردم درست جلوی چشم ما ناپدید می شن. گاهی هم با این که تمام مدت جلوی چشم دیگران هستیم ناپدید می شیم و دوباره پیدامون می کنن. گاهی حتی خودمون رو هم نمی تونیم پیدا کنیم این درست موقعیه که از خودمون غافل می شیم. سندی بعد از گم شدن همکلاسی دوران کودکیش (بیست سال قبل از شروع ماجرا) دچار وسواس پیدا کردن وسایل گمشده ش میشه. این وسواس باعث میشه کم کم خانواده و دوستانش رو گم کنه. اونا هم بعد از مدتی اونو گم میکنن. Mở đầu không ấn tượng, tới tận chương 8 vẫn chưa biết tác giả có mục đích gì ko khi xây dựng 1 nhân vật chính tâm lí bất ổn và tính cách thì nhạt nhẽo, dở hơi. Bắt đầu thấy nản rồi mà vẫn ráng đọc, tại tôi ko có thói quen bỏ ngang một thứ gì đó. Hi vọng mong manh truyện sẽ đỡ nhạt hơn xuất hiện ở chương 15/55 và hi vọng đó chính thức bị dập tắt ở chương 26/55 cho đến tận cuối sách luôn =.="
Interesting premise, about where missing objects go. The whole thing had lots of potential, but I got so bored halfway through. I finally snapped and decided I didn't really care about Sandy's missing sock or Sandy herself, who goes missing (oh the irony) and began skim-reading. The concept itself that these missing things and people go somewhere where cultures and such coexist and people live in harmony and (lost) food pops up just like that to fill all bellies was SO ridiculous. Sounds more li Interesting premise, about where missing objects go. The whole thing had lots of potential, but I got so bored halfway through. I finally snapped and decided I didn't really care about Sandy's missing sock or Sandy herself, who goes missing (oh the irony) and began skim-reading. The concept itself that these missing things and people go somewhere where cultures and such coexist and people live in harmony and (lost) food pops up just like that to fill all bellies was SO ridiculous. Sounds more like Children's fiction to me. This review has been hidden because it contains spoilers. To view it, click here. This book is quite odd. There's a lot of repition thus far about Sandy searching for things. Just. Really. Nailing. That. Down. Ok, I agree with other reviews that this ending was totally cheesed out. I would have only give it 1 star if it hadn't been for the photo she ended up bringing back with her. But even then, I think the ending could have been done very differently. It also managed to get 3 stars out of me because the concept was cool. The idea that things really can be missing, not just This book is quite odd. There's a lot of repition thus far about Sandy searching for things. Just. Really. Nailing. That. Down. This review has been hidden because it contains spoilers. To view it, click here. Cecelia Ahern. Gue pikir dulu namanya ditulis seperti ini: Cecilia Ahern. Ya, yang biasanya emang gitu kan? Cecilia? Dan penulisan nama Cecilia tadi membuat gue yakin, WOW.. Cecilia Ahern ini beneran orang Barat loh bow! Desse kan orang terkenal di Ireland bukan ya? Tapi begitu gue amati lagi, ternyata namanya ditulis seperti ini: CECELIA. *siap-siap pasang suara Feni Rose*, "apakah… Cecelia Ahern… sesungguhnya berasal dari Jawa Barat? *JENGJEN Cecelia Ahern. Sampe disini semua orang pada bingung. Kok Jawa Barat sih, Far? Loh, Iya dong. Coba liat biografinya. Dia lahir tahun berapa? 1981. Berarti dia lebih tua dari gue dong? Dan di Jawa Barat, perempuan yang lebih tua dipanggil apa? Teteh. Atau Ceceu. Dan karena nama panggilannya Lia, jadi gue manggil dia Ceceu Lia. Kita mask ke bagian review. Yang lebih normal dikit. Gue udah membaca 2 dari 3 novel Cecelia Ahern. Yang pertama, P.S. I Love You (and my boyfie kept saying, "P.S. I love you… P.S. I love you.." when he first found out that I was crying out loud after reading that novel. Yes, I love you too, Boyfie) dan A place called here. Yang akan gue bahas reviewnya kali ini. Buku ketiga yang akan gue baca adalah Thanks for the memories. Buku-buku Cecelia Ahern yang gue baca selalu dalam bahasa Inggris. Yang pertama berbentuk e-book, yang sampe sekarang masih ada di dalam hp gue, dan yang kedua adalah novel yang gue pinjem di library. Dari segi ide cerita, gue akui ide ceritanya brillian. Kalau buku pertama bisa membuat gue menangis sedemikian rupa, buku kedua ini bisa membuat gue penasaran sampai di halaman terakhir. Buku-buku ini membuat gue memahami apa yang dipikirkan, dan dirasakan oleh tokoh utama di dalamnya. Tapi tidak berhasil membuat gue melambungkan imajinasi lebih tinggi lagi. Menurut gue, buku yang berhasil menyampaikan ide pengarangnya adalah buku yang berhasil membuat pembacanya merefleksikan cerita di dalamnya. Misalnya membuat gue berpikir, apa yang akan gue lakukan kalau gue jadi Holly, atau kalau gue jadi Sandy Shortt, atau kalau gue jadi Jack Ruttle. Buku-buku yang berhasil membangun refleksi gue terhadap ceritanya, adalah Dunia Sophie, walaupun refleksi pertama yang gue dapet adalah gue akan membuang surat-surat sialan itu kalau gue jadi Sophie. Tapi buku-buku yang disuguhkan Cecelia Ahern begitu nyata. Begitu logis. Sehingga tidak ada pilihan lain bagi si pembaca. Atau kalaupun ada, si pembaca tidak dapat membuat kisah yang sama menariknya dengan yang ditulis Ceceu Lia. Maksud gue, pilihan apa yang bisa dibuat oleh gue disaat gue dihadapkan sama kasusnya Sandy Shortt? Dari awal aja udah kelihatan Sandy Shortt bukan gue banget. Sandy Shortt, yang namanya kontradiktif dengan penampilan fisiknya. Rambutnya bukan lagi sand color. Ngga cocok sama nama Sandy. And she is definitely NOT short. Ngga cocok sama nama Shortt. Kalo gue? Farah. Bahkan orang-orang disekeliling gue, yang bukan orang Sunda pun, yang bisa ngomong F bukan P, suka kejam memanggil gue, "Parah Parah". Gue pikir cuma orang Sunda doang yang ngga bisa ngomong F. Bisanya P.
Kedua, Sandy Shortt punya obsesi menemukan barang yang hilang. Sementara gue..
"ah males kagak ketemu. Pake punya si Babi Air dulu aja lah.."
"kabel data si Babi Air mana nih? Mati gue.. Punya gue udah ketemu, giliran punya dia yang nyelip. Sompret ah!" Gue tidak segitu terobsesinya menemukan barang hilang. Kalo barang gue ada yang hilang, ya pake aja dulu yang lain. Kalo ilangnya masih diseputaran rumah juga paling beberapa hari, atau bulan, atau beberapa tahun ke depan deh paling telat, bakalan ketemu juga. Tapi mungkin itulah tujuan utama Ceceu Lia. Memberikan batasan pada ceritanya yang, memang gue akui, spektakuler dan tidak memberi kesempatan bagi pembacanya untuk merusak jalan cerita dengan imajinasi yang kadang begitu melonjak-lonjak dan meletup-letup. Cerita A placed called here ini begitu familiar. Karena kale gue tidak salah, beberapa ide serupa pernah diangkat ke layar lebar. Contohnya Jumanji, dan versi hi-tech dari Jumanji, Azura. Gue akan memberikan sebuah hint disini. Inilah spoilernya. Kemana sebenarnya Sandy Shortt pergi? Menurut gue, dia tidak pergi kemana-mana. Dia terperangkap di dalam kepalanya sendiri yang dengan tidak disadarinya, membangkitkan seluruh informasi yang diketahuinya mengenai kasus orang-orang hilang yang pernah ditanganinya. Mengapa Sandy Shortt tidak bertemu Donal Ruttle disana? Apakah sejak awal Sandy sudah memiliki firasat bahwa Donal sudah meninggal? Bukan, karena Sandy belum sempat bertemu dengan Jack. Jadi dia belum menyimpan informasi lebih dalam mengenai Donal. I bought this book in 2007, I started reading it immediatly. But I never liked it enough to keep reading. I decided on reading it again last month and I feel like it took me ages to read. I really liked the concept of someone who hates it when things go missing. Who starts a missing persons agency and then goes missing herself to end up on the place where the missing things and persons go. I was very excited to read this book from Cecilia as I loved ps;i love you. But the beginning really bored I bought this book in 2007, I started reading it immediatly. But I never liked it enough to keep reading. I decided on reading it again last month and I feel like it took me ages to read. I really liked the concept of someone who hates it when things go missing. Who starts a missing persons agency and then goes missing herself to end up on the place where the missing things and persons go. I was very excited to read this book from Cecilia as I loved ps;i love you. But the beginning really bored me. I forced myself to read it again a year later, failed and forced myself to read it again last month. It did get better, I liked her time at that place called Here. And I would find myself really feeling for her and Jack Ruttle. Cause I was dying to find out what would happend, if Jack would find his brother and most importantly Sandy. And if Sandy would get home and find the 'Here' place so she could 'free' all the missing persons. But the ending, I think, was horrible. I would have loved to know what happened to her 'missing' friends. If they would actually search for the 'Here' place. I'm kinda dissapointed in the ending. The premise is promising, about certain place containing missing people and missing things. But I just couldn't get it. I couldn't care the least towards the characters.... Okay, they're missing someone, so? Okay, they're in the middle of nowhere and waiting to be found, so? I think this would be a very great book if the characters were multi-dimensional and had some...I don't know, uniqueness? I don't even like the character's name, Sandy Shortt. Okay, that's trivial @_@ I just can't relate to her, even though I often lose things myself and desperately need to find them. And why the point of views? Couldn't it be enough to use only one point of view? I mean, I've felt tired enough to listen Sandy's whine, let alone Jack or whatever their names are. I don't mind about multiple point of views, actually, but the question is, would I care enough to learn much about the characters? If not, well, why bother to read each of the point of views? Sandy Shortt begitu terobsesi dengan menemukan sesuatu hal-hal yang hilang, karena saingan masa kecilnya, Jenny-Mei Butler telah hilang. Setelah bekerja untuk Garda, kepolisian Republik Irlandia, dia meninggalkan pekerjaannya untuk memulai agen mencari orang hilang. Suatu hari, seorang pria bernama Jack Ruttle meminta Sandy untuk bantuan mencari adiknya Donal, yang hilang selama setahun sebelumnya. Dia setuju bersedia membantu Jack dan Sandy tidak pernah mengharapkan untuk menjadi hilang sendiri saat dia menemukan dunia di mana segala sesuatu yang pernah hilang, tempat yang disebut di sini. Jack melanjutkan pencarian untuk Sandy percaya bahwa dia adalah kunci untuk menemukan saudaranya tetapi belajar lebih banyak tentang kehidupan pribadinya daripada yang seharusnya. Sementara itu, harta Sandy terus tersesat dari sini tapi menemukan di dunia ini. Sesuatu pasti akan terjadi tapi keduanya belum tahu apa itu. Sebuah karya yang indah dan menakjubkan dari Cecelia Ahern. Seiring dengan "If You could see me now", "Where rainbows End" dan "The book of Tomorrow", buku ini seperti biasa membangun dunia romantis nan ajaib untuk Cecelia dan pembacanya. Ini adalah dunia di mana kau dapat menemukan dirimu lebih mendalam, dalam situasi pahit dan menemukan impianmu mungkin hilang dalam masyarakat sibuk dengan kehidupanmu. Secara pribadi aku sangat menyukai teori bahwa semuanya hilang dan begitu pergi ke suatu tempat, kadang-kadang karena pilihan kita, kadang-kadang karena kekuatan di luar kendali kita, tetapi "ketika kita belajar tentang apa yang jiwa kita perlu belajar, jalani hadiah itu sendiri" dan yang paling indah hal tentang tersesat adalah bahwa "kita menemukan" jika seseorang masih mencari kita di luar, kita selalu menemukan. Aku suka dunia kata-kata Cecelia menggunakan dalam setiap buku, itu indah, sederhana tapi manis dan menyentuh. Aku suka cara Cecelia mengungkapkan beberapa hal sederhana tentang kehidupan dan cinta, itu benar-benar begitu menyentuh bagiku. Ahern has mastered a technique to lead people down memory lane. There's No Place Like Here speaks of things that just grow feet, wander off, cross the periphery, and never return for good. "Here" is where my small, blue, fragile toy kangaroo has now found shelter in, where those pens I've previously thought just went inside somewhere deep in my pants' pockets have probably nested about, where that Pokemon book I was dying to read when I was eleven had got teleported to, and where my white Conver Ahern has mastered a technique to lead people down memory lane. There's No Place Like Here speaks of things that just grow feet, wander off, cross the periphery, and never return for good. "Here" is where my small, blue, fragile toy kangaroo has now found shelter in, where those pens I've previously thought just went inside somewhere deep in my pants' pockets have probably nested about, where that Pokemon book I was dying to read when I was eleven had got teleported to, and where my white Converse shirt has now has now found home in Bobby's stock. The book was flawless. Not in the rhetoric sense maybe, but somewhere deep down, it hits us bare and faultlessly. Ahern knows how to appeal to sentiments, especially the thoughts of losing, the pain of coping, and the agony of waiting. I rate it a bold five stars out of five. The book hit closer to eight years ago when finding my lost toys was everything I had to my name. And I wouldn't call that 'sentimental bias' or anything. I treasure everything that I have a hundred times more when it's missing. Ali ne mogu reći ni da mi se baš svidjela ni da je ostavila neki super dojam na mene. Svi hvale Cecu, al meni se (pročitavši zasad dvije njene knjige) ne čini kao neka posebno dobra autorica. I actually stopped reading this book half way through (something I RARELY do). I don't know if it is because I'm not feeling well, or the book itself, but I just couldn't read any more. I skipped to the final pages, and lo and behold the ending was just what I thought it would be, so I figured why read another 150 pages. Já li há uns anos e do que me recordo é que foi um desapontamento, o tema era curioso, mas quanto a mim algo falhou. Considerei-o desinteressante. Things go missing all the time. Even we feel lost most of the time. We're all just trying to navigate our way through life the best way we can, but truth is.. though we seldom admit it, we become lost. In "There's No Place Like Here" we see an imaginative world where all missing things go. It felt like nowhere but really was somewhere. It was simply called 'Here'. We see the protagonist journeying her way through this world to truly find herself, while helping a few unlikely people on the way. Rea Things go missing all the time. Even we feel lost most of the time. We're all just trying to navigate our way through life the best way we can, but truth is.. though we seldom admit it, we become lost. Reading it was such a delight for me because it was uniquely written. Most chapters are really short and also most paragraphs. It was sort of a back and forth; two streams of consciousness simultaneously happening and alternately narrated. Hard to explain but when you read it, you'll see that it just really works and helps build that tension before each revelation that comes out in the plot. The author was really good in the way she gave out information in the story. You kind of knew what's going to happen next but at the same time you had no idea at all. Somehow you felt a little lost most of the time but it helped to add in the pot of confusion that leads to enlightenment in the end. This book is really hard to get into, but if you do make it through the whole book, the ending is good. I finished this book with a good feeling, and the last 75-100 pages were actually really great. Although this is my least favorite Cecelia Ahern book, she has a knack for writing. I love her style of writing, and her ability to make magic and fairy tales come to life for adults. This book is about a place called Here, where all missing things and people end up. Sandy Shortt is a 34 year old wom This book is really hard to get into, but if you do make it through the whole book, the ending is good. I finished this book with a good feeling, and the last 75-100 pages were actually really great. Although this is my least favorite Cecelia Ahern book, she has a knack for writing. I love her style of writing, and her ability to make magic and fairy tales come to life for adults. This book is about a place called Here, where all missing things and people end up. Sandy Shortt is a 34 year old woman who has had an obsession searching for missing things since she was 10 and a girl in her class dissappeared. Sandy now runs a missing persons agency, and agrees to help a man named Jack find his brother who has been missing for over a year. Ενα βιβλιο που μιλαει για το κουραγιο κ την υπομονη, την πιστη που πρεπει να εχουμε στους αγαπημενους μας κ πανω απο ολα ποτε να μην ξεχναμε... εξαλλου τιποτα δεν πηγαινει στο πουθενα, ολα καπου καταληγουν αρκει να συνεχισουμε να ψαχνουμε, να μην λησμοναμε. How would a childhood tragedy affect your growing years? For Sandy Short she became OCD with losing items after a classmate at the age of ten disappears. Things that go missing worry Sandy and her parents are beside themselves with her constant need to find what is missing. Sandy is hooked up with a counselor at school but her need to find never stops and thus her job as a police officer in the missing person department fits her well. Of course, there are a handful of individuals she never finds How would a childhood tragedy affect your growing years? For Sandy Short she became OCD with losing items after a classmate at the age of ten disappears. Things that go missing worry Sandy and her parents are beside themselves with her constant need to find what is missing. Sandy is hooked up with a counselor at school but her need to find never stops and thus her job as a police officer in the missing person department fits her well. Of course, there are a handful of individuals she never finds and these people she carries around with her and is always following up on leads to discover something new. Introduce another fellow whose brother has gone missing a year ago, he contacts Sandy to help him and after a brief passing of each other... Sandy goes missing, Jack is now the person trying to locate Sandy and in the process he discovers where his brother is. On the other hand, we the readers, discover where all the missing items and people go, Sandy has found them. We know that the movie Wizard of Oz comes into play here, but to what extent? Has Sandy found a worm hole, or maybe a rabbit hole of reality? Is there a rip in the space time continuum? So many possibilities... Sandy finds many on her list of missing including the first person to go in her life, but not Donald... Was it a mere accident, a whimsy dream, a coma like status that heightens her conscious brainwaves? Sandy's therapist begs for her to accept the losses, to attend meetings for OCD individuals and she does this for him but still she has always looked for the many not found. I believe in the end... Sandy discovers her joys are right in front of her and she best count her blessings. There were so many things to consider while reading this story. Time, relationships, people, consequences, acceptance, death, grief, closure. This story moved from the past to the present through out the story and flowed with a magical quality. Sandy Shortt is an ex-Garda from Leitrim. She now runs a missing persons agency - she has been obsessed with finding missing things since a classmate went missing aged 10. Sandy has devoted her life to finding things and people, but when Sandy herself goes missing, who will find her? I try to dial my cynicism down a notch when I read Cecelia's books. I go to them when I've had a couple of heavy reads and want something light. But this was not enjoyable. I had the American version, called "There' Sandy Shortt is an ex-Garda from Leitrim. She now runs a missing persons agency - she has been obsessed with finding missing things since a classmate went missing aged 10. Sandy has devoted her life to finding things and people, but when Sandy herself goes missing, who will find her? I try to dial my cynicism down a notch when I read Cecelia's books. I go to them when I've had a couple of heavy reads and want something light. But this was not enjoyable. I had the American version, called "There's No Place Like Here", I know that the European version is called "A Place Called Here". I don't know if the description of how Irish Coffee was invented, the description of changing a "diaper" or the description of how to correctly pour Guinness were in the European version or if that was solely for the US market but all three irritated me. Sandy, herself, was inherently unlikeable. I didn't care what happened to her. She was obnoxious, obsessive, rude, and mean. She was horrible to a little child, and even more horrible to her family. I found her "relationship" with Gregory completely and utterly inappropriate and was not rooting for them. I found her obsessions unbelievable and irritating. Having grown up in Leitrim, I found some parts ridiculous, particularly the referral to "Leitrim Town" (no such town exists, there's Leitrim Village) and "Leitrim National School" which implies one National School in the entire county. The ending made no sense - Sandy was so grateful to Jack but he had absolutely nothing to do with the conclusion. Nothing. The premise was interesting, but the place Sandy went lacked atmosphere and the book dragged for me. I didn't enjoy it and I'm starting to think that this author is just not for me.